When I first wrote that I was going to test drive a Smart Fortwo car for a week, a commenter warned me to stay off the 400 series highways. That's all I needed to hear. The first thing I did when I got the keys from Mercedez-Benz this morning was hit the 401 and 403. At 120 km/h everything felt fine. I can now vouch for the fact that the Smart Car can go on the highway. It really didn't take long to get used to the fact you're the smallest thing on the road. It was a lot of fun, and you can parallel park into freakishly small spots. As much as I love the size of the Smart Fortwo, that's also its greatest weakness. At least it is for a father of two. 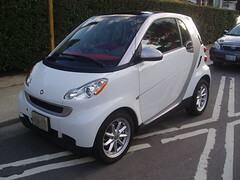 If I have to get the kids somewhere, the Smart Fortwo is simply not an option. Even without passengers there's a storage issue. My laptop filled up half of the "trunk". To be fair, I don't think anyone expects the Smart Car to have much storage space. The joy of this car is that's it's tiny, but you never feel unsafe. I'm going to try and break this sucker over the next week and I'll report back on how I did. Looking forward to a full report, I have a 2006 Ford Escape Hybrid and am looking to convert my '74 TR6 to all electric. 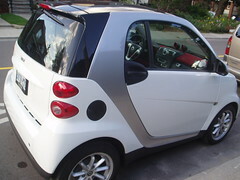 The Smart Car was always on my list as a commuter if the 'leccy won't cut it. What's the sticker price on the one you have? Is it diesel or gas? This one I have is gas. They tell me the sticker price for the passion coupe I'm driving is $18,000. Where's Toyota? Don't they read this blog? I want to test drive a Prius Hybrid! How can anyone feel safe driving this thing in the city, let alone the 401? You may as well be driving a skateboard. Mike where are your thoughts on the Michael Bryant story? The smart car should be around 10K not 20. Yawn - call me when the Tata Nano comes to Canada. 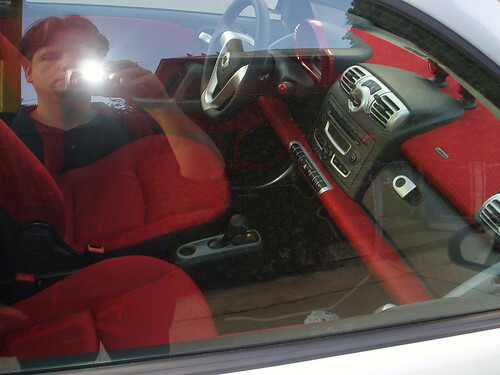 Typical woman comment......"I love the interior."